That Bosnia and Herzegovina (BiH) has a long way to go until it deserves membership to the European Union is a fact no one is growing any illusions about. That the country has tough past but that since it has a new government has achieved a lot, also no one is denying. That the EU will not leave the country, is also being confirmed relatively on a regular basis. But in order Bosnia and Herzegovina to start walking this way, there is only one condition - the Sejdić-Finci amendment, on which there is a ruling of the European Court of Human Rights. This became unequivocally clear during the first visit abroad of the new president of the federation, Bakir Izetbegovic (son of late Alia Izetbegovic), which took place on March 21 in Brussels. Those were initially two separate cases, which were then merged into one by the European Court of Human Rights in 2009. Plaintiffs were Jakob Finci, a Jew, and Dervo Sejdić, a Roma. Under BiH's constitution only ethnic Bosniaks, Serbs and Croats can be elected for members of the presidency of BiH or of parliament. Finci and Sejdić, however, protest against these provisions. The EU is constantly insisting the federation to comply with the court's ruling and to make the necessary amendments to its constitution to ensure that the rights of all minorities in the country will be respected. So far, though, the leaders of the six main parties in Bosnia fail to reach an agreement on the ways the decision of the court to be implemented. A special parliamentary committee was established, tasked to come up with amendments to the constitution, taking into account the court ruling, but its mandate expired on March 12. This was the deadline for a political agreement too, the Balkan Insight reports. The European court's ruling requires the amendments to allow not only representatives of the minority groups to stand for public positions but also representatives of the three main ethnic groups to be able to take public positions in all counties, including the state presidency and parliament. This means Serbs to be able to take public positions in the Muslim-Croat Federation and Bosniaks and Croats to do the same in Republic of Serbia. Regretfully, however, in the fragile statehood of Bosnia and Herzegovina political maturity is still lacking. Because of the put forward by the EU, the Parliamentary Assembly of the Council of Europe (PACE) and by the European court conditions, some political representatives openly oppose. There are Bosnian leaders who say that they will not allow being pushed for deadlines, imposed from the outside, and the leader of the Serbian Democratic Party, Mladen Bosic, even said that more important was to reach an agreement in the interest of Bosnia's citizens, rather than "to satisfy the interests of 'someone in Brussels or Chicago'", according to Balkan Insight. But the EU seems too exhausted by its own problems and the indeed painful enlargement in the past years and does not seem to be listening to such reprimands. With cool determination the EU leaders inform their Bosnian partners what the path is and do not leave even the slightest doubt in their inexorability. 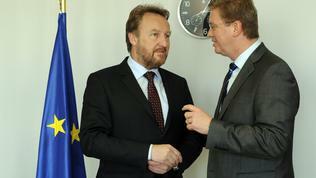 The other day's visit of Bakir Izetbegovic in Brussels was not an exception. May be the most affectionate was European Parliament chief Martin Schulz, who tried to provide something more to his guest by pointing out that he had arrived in the building of parliament even earlier than the German Schulz, which "is a good signal that BiH is running ahead". 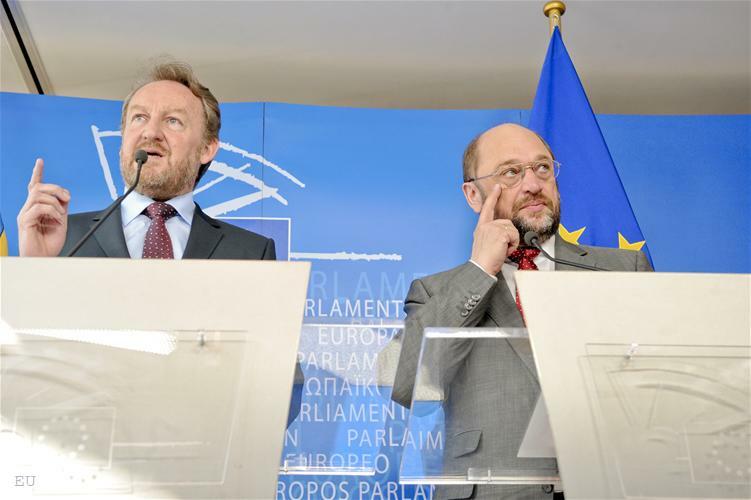 Schulz also said that the fact that Mr Izetbegovic had chosen Brussels for his first visit abroad also was a strong signal of the pro-European commitment of the country. 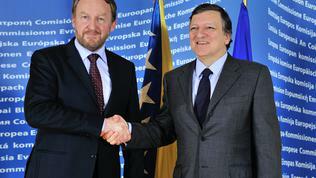 Nevertheless, Schulz reminded that Bosnia had to comply with the court's ruling on the Sejdić-Finci case. 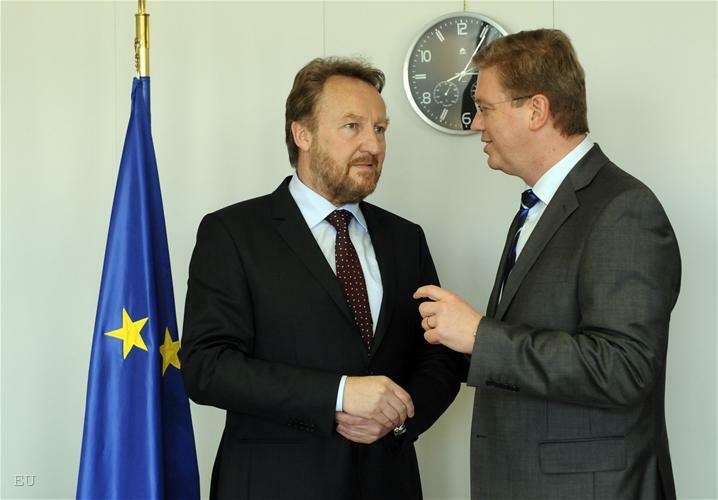 For his part, Izetbegovic pointed out that his country had achieved a lot in the past few weeks after the forming of a new government 15 months after the elections. In his words, Bosnia had finally achieved something on its own. "What is important, this is for the 1st time after Dayton a completely our product, something achieved by domestic efforts", the president said and hoped that next time problems would be solved not in 15 months but in 15 days. In the words of the new Bosnian president, on other important issues there might not be consensus in his country but there was in terms of European integration. "We are Europeans, we are surrounded by the EU and I hope in the next 10 years to complete that process", Bakir Izetbegovic said and added that Bosnia would file application for membership in June. 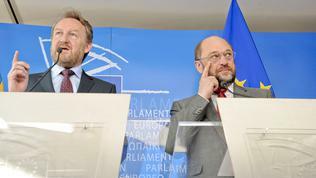 President Schulz emphasised several times on the word 'integration', which in his words was repeated a number of times during his meeting with Izetbegovic. He even explained what it meant - a well balanced structure in the country, which respects all specific circumstances, responds to justified demands of the different groups, but also respects the common interest of a sovereign country. 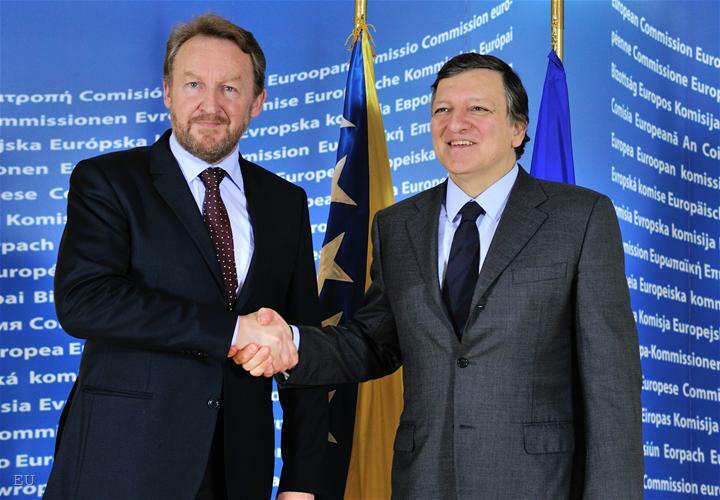 May be most distanced with his guest was European Commission chief Jose Manuel Barroso, who emerged from his meeting with Izetbegovic overlapping his words while reading quickly the prepared in advance statement, as if he wanted everything to end quickly so that he could retreat to do more important things for the day. Without wasting time in redundant words, Mr Barroso said that in spite the scored progress Bosnia is expected to advance on the Sejdić-Finci case. "As you know the European Union is built on a culture of dialogue and compromise. Political responsibility and readiness to find commonly agreed solutions are crucial in order for Bosnia and Herzegovina to achieve further progress in the European integration process", Barroso underlined, thus making it clear that BiH has still a long way to go before achieving that political maturity that would allow its components negotiate in a spirit of partnership and to reach compromises for the sake of their common interest - EU. 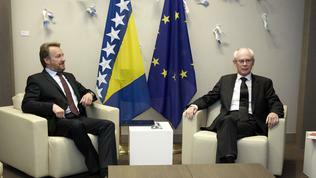 European Council President Herman Van Rompuy also noted after his meeting with his Bosnian guest, that Bosnia and Herzegovina's future was in its own hands. 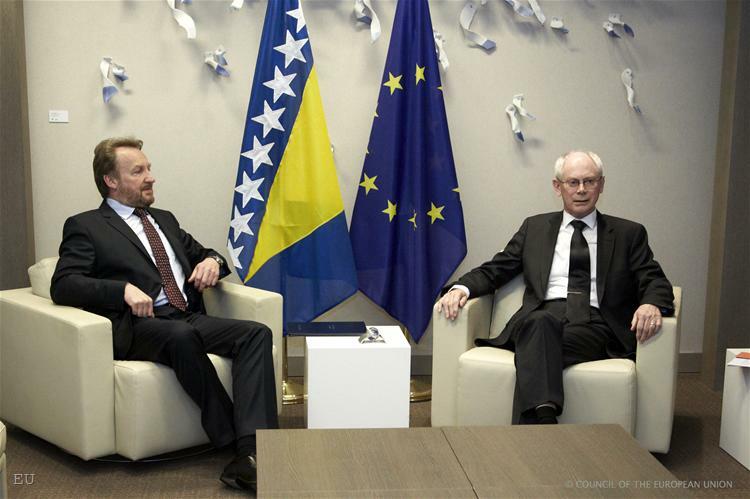 "We strongly encourage Bosnia and Herzegovina to fully implement the ruling of the European Court of Human Rights in the Sejdic–Finci case, and thus open the door for its further European integration", were Van Rompuy's words. The three European leaders (Schulz, Barroso, Van Rompuy) underlined that Bosnia had to benefit from the movements that were taking place in the Balkans at the moment (in the words of Jose Manuel Barroso) - Croatia signed an accession treaty and in 2013 it will become the 28th member of the EU; Serbia has finally been granted a candidate status and is expected to start negotiations; a visa liberalisation dialogue is being initiated with Kosovo. To Barroso's list we can also add the Commission decision to start accession dialogue with Macedonia, which replaces the actual negotiations, blocked by Greece because of the name dispute. Bosnia has to take advantage of all this and to undertake the necessary steps in order to achieve its European future. If Bosnia puts sufficient efforts to align its constitution with the court's decision, this will ensure the entry into force of the Association Agreement, already ratified by all member states. This material is shockingly correct: "Under Bosnia and Herzegovina (BiH) constitution only ethnic Bosniaks, Serbs and Croats can be elected for members of the presidency of BiH or of parliament!" No room for Roma, Jews and others living within the borders of the fair republic. What would they think of next?